The DropStop is a new type of anti-chain drop device for road and mountain bikes. The DropStop is ideal for full suspension mountain bikes or road bikes with non-round or oversize seat tubes which make it impossible to mount other types of anti-drop devices. The DropStop is mounted and firmly clamped into position using the bicycles bottom bracket. The DropStop totally protects the frame from chain damage due to chain-drop and keeps the chain running on the inner chainring. The DropStop is sold in two sizes. 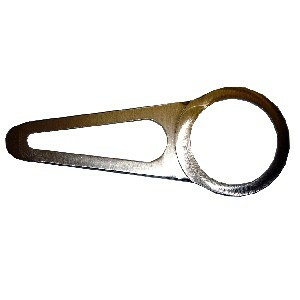 The longer size is for road bikes and will protect up to a 39 tooth small chain ring. 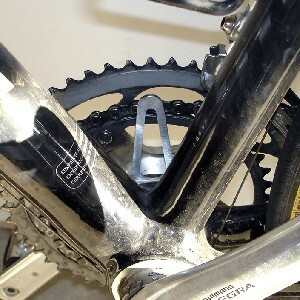 The shorter size will work with most cross and mountain bikes with small chain rings up to 32 tooth.